Posted on July 30, 2015 by Matt Frazier / This entry was posted in Informative and tagged glass art, glass bowl, made in america, mia. Bookmark the permalink. American Blown Glass is clearly some of the best glass produced today. American Blown Glass – The first thing our customers notice in our New York City smoke shop is our U.S.A. section. Everyday we watch people browse our selections looking for the glass pieces that speak to them. There is a unique choice for everyone that walks into our store, and we make it our priority to find the perfect one for your needs! We definitely prioritize our American blown glass, but there are always pieces that fit our style from countries all over the world. My personal favorite are the unique and affordable Polish pipes that we offer. But let’s face it, the work that American glass blowers are producing today literally “blows” the competition out of the water – but for a price. American blown glass is known to be more expensive than glass produced in other countries because the artists are able to spend more time and resources on the each individual piece. While every pipe is hand blown in the shop, it is clear what sets American blown glass from the rest. The difference in our shop is the dedication to nothing but the absolute best, and so naturally we are always bringing in more American glass. In an effort to support the American glass blowers, we understand how important it is to buy our glass from domestic merchants. We see our shop is a small local shop, and understand that the markets have changed for small business in recent years. In other words, we know the importance of supporting those around you, and seize any opportunity to showcase our American blown glass! “Made in America” might not be a phrase commonly associated with glassblowing; however, the time is NOW to choose domestic when you shop! Not only does this empower local artists in their pursuit of the craft, but also promises quality that goes above and beyond the standard, subpar pieces that are almost guaranteed to break, dent, or underwhelm in a major way. The Curls + Swirls Glass Chillum that just arrived is just one example of the attention to detail that is infamous with American blown glass production. The Bushwick community has expressed frustration with the lack of interesting glass in the area, and American blown glass is the fancy and unique glass that they are looking for! We provide one of the largest, quality selections in New York City, and our reviews back us on that. We have American blown glass is a price range for anyone, from $35 and up. There’s a reason people are always shocked to find out they lived near an awesome head shop. Not only because of our unique selection and killer style, but because you won’t find these prices elsewhere! Plain and simple. Don’t believe us? Come and see for yourself on our pipe table – this has been a staple of our store since the very beginning, and our team guarantees that our selection can survive a fall from the table and not show any damage! 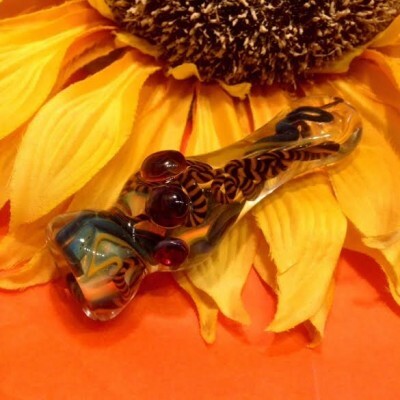 Seeing a surprised face at the variety of our options is something we’re used to, so come experience the Sunflower Pipes difference at our store! 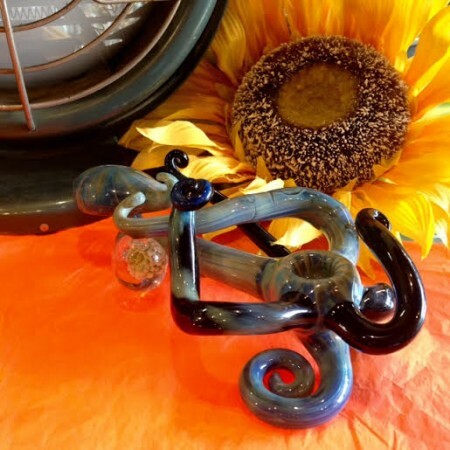 At Sunflower Pipes, our team considers our presentation of American blwcurate nothing but excellence in each and every piece. Our “Made in America” selection includes intricately weaved pieces, animal pipes, colors, shapes and sizes of all kinds. Most recently, Erik and Lydia, proud owners of our little shop that could, have traveled to Las Vegas, Woodstock, and many exciting locations to hand select stunning glass art that serves as not only a smoking apparatus, but a wonderful conversation starter that can brighten any room! Crush Glass, one of the newest additions to 12 Wilson Avenue in Bushwick, is a vast network of American glassblowers that was founded in 1996. We’re fortunate to offer a selection of their dynamic glass bowls that you’ll notice the moment you walk through our doors.